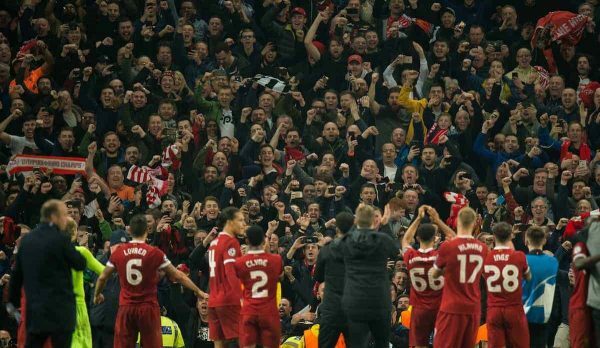 Liverpool are on cloud nine after reaching the Champions League semi-finals for the first time in a decade, with a wonderful spirit being created on and off the pitch. It was another famous night in the Reds’ rich history, as they rode a first-half storm at the Etihad, before winning 2-1 and completing an impressive 5-1 aggregate triumph. Gabriel Jesus’ very early strike proved to be a false dawn for the hosts, and Mohamed Salah and Roberto Firmino fired Jurgen Klopp‘s side to victory in the second-half. 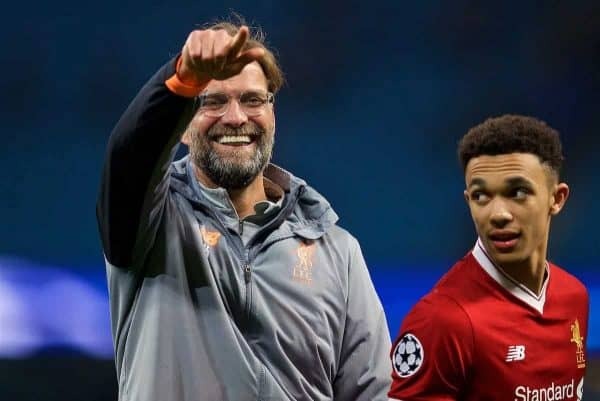 Man for man, City are the better team, without question, but Klopp has created a team spirit that shone bright, both in Manchester and in the first leg at Anfield. In a first-half full of adversity, the players dug deep for one another, and they excelled as a unit the more the match progressed. BT Sport covered the match, and they have released a video that sums up the togetherness that exists at Anfield these days. The footage shows Klopp and his players celebrating with the magnificent away supporters after the final whistle, as the Etihad empties all around them. With a stirring rendition of “Allez! Allez! Allez!” being sung by the travelling faithful, the heroes on the pitch enjoy their moment. You can see just how close the entire squad is, with genuine delight on their faces, and handshakes and hugs taking place galore. There is one man to thank for all of this: Klopp. The manager has been fantastic, and while baby steps have been made at certain times, to reach a Champions League semi-final in two and half years is phenomenal. He has united a fanbase that was unhealthily split during the final months of Brendan Rodgers’ reign, and has got the Reds playing some of their most vibrant attacking football of all time. No players are speaking of being unhappy, question marks aren’t being raised about team selection and everything feels like it is being run smoothly. Liverpool can go all the way in Europe this season, and the way in which they dispatched a City side many feel are the best in Europe speaks volumes about their quality. Even if they fall short in their quest for glory, this has still been another huge step in the right direction, as Klopp continues to build something special.